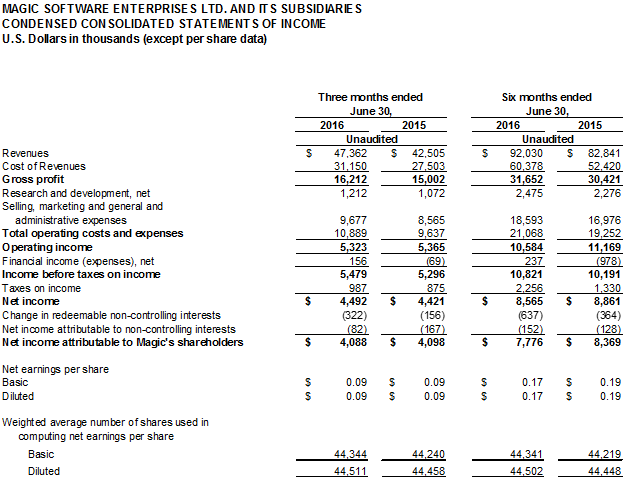 Or Yehuda, Israel, August 10, 2016 – Magic Software Enterprises Ltd. (NASDAQ and TASE: MGIC), a global provider of mobile and cloud-enabled application and business integration platforms, announced today its financial results for the six months and second quarter ended June 30, 2016. Revenues for the second quarter increased 11% to $47.4 million compared to $42.5 million in the same period last year. Operating income for the second quarter decreased to $5.3 million from $5.4 million in the same period last year. Non-GAAP operating income for the second quarter remained constant at $6.5 million compared to the same period last year. Net income for the second quarter remained constant at $4.1 million, or $0.09 per fully diluted share, compared to the same period last year. Non-GAAP net income for the second quarter remained constant at $5.2 million, or $0.12 per fully diluted share, compared to the same period last year. Revenues for the first half of 2016 increased 11% to $92.0 million compared to $82.8 million in the same period last year. Operating income for the first half decreased to $10.6 million compared to $11.2 million in the same period last year. Non-GAAP operating income for the first half of 2016 remained constant at $13.2 million compared to the same period last year. Net income for the first half decreased to $7.8 million, or $0.17 per fully diluted share, from $8.4 million, or $0.19 per fully diluted share, in the same period last year. Non-GAAP net income for the first half decreased 3% to $10.0 million, or $0.23 per fully diluted share, compared to $10.4 million, or $0.24 per fully diluted share in the same period last year. Operating cash flow for the first half of 2016 amounted to $13.4 million. Total net cash, cash equivalents and short-term investments as of June 30, 2016, amounted to approximately $82 million. Magic is raising its revenue guidance for the 2016 fiscal year to $195 to $200 million, up from prior guidance of $191 to $195 million, reflecting a revised annual growth rate of 11%-13%. Magic’s management will host a conference call today, August 10, at 10:00 am Eastern Daylight Time (7:00 am Pacific Daylight Time, 17:00 Israel Daylight Time) to review and discuss Magic’s results. For those unable to join the live call, a replay of the call will be available until November 11, 2016, under the investor relations section of Magic’s website. This press release contains the following non-GAAP financial measures: Non-GAAP gross profit, Non-GAAP operating income, Non-GAAP net income attributed to Magic’s shareholders, and Non-GAAP basic and diluted earnings per share. Magic believes that these non-GAAP measures of financial results provide useful information to management and investors regarding certain financial and business trends relating to Magic's financial condition and results of operations. 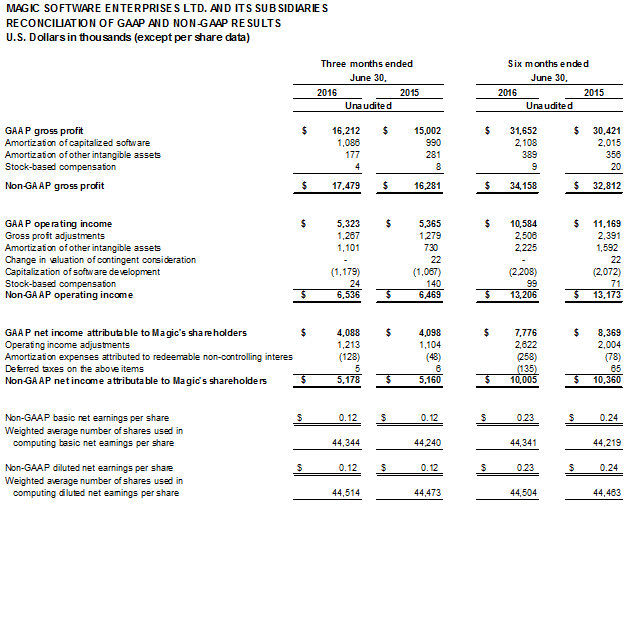 Magic's management uses these non-GAAP measures to compare the Company's performance to that of prior periods for trend analyses, for purposes of determining executive and senior management incentive compensation and for budgeting and planning purposes. These measures are used in financial reports prepared for management and in quarterly financial reports presented to the Company's board of directors. 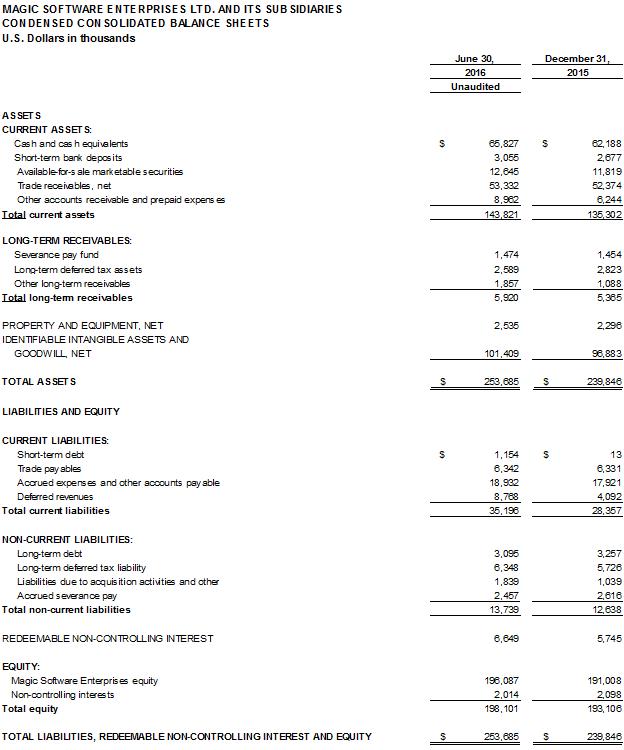 The Company believes that the use of these non-GAAP financial measures provides an additional tool for investors to use in evaluating ongoing operating results and trends and in comparing the Company's financial measures with other software companies, many of which present similar non-GAAP financial measures to investors. Management of the Company does not consider these non-GAAP measures in isolation or as an alternative to financial measures determined in accordance with GAAP. The principal limitation of these non-GAAP financial measures is that they exclude significant expenses and income that are required by GAAP to be recorded in the Company's financial statements. In addition, they are subject to inherent limitations as they reflect the exercise of judgment by management about which expenses and income are excluded or included in determining these non-GAAP financial measures. In order to compensate for these limitations, management presents non-GAAP financial measures in connection with GAAP results. Magic urges investors to review the reconciliation of its non-GAAP financial measures to the comparable GAAP financial measures, which it includes in press releases announcing quarterly financial results, including this press release, and not to rely on any single financial measure to evaluate the Company's business. The related tax, non-controlling interests and redeemable non-controlling interests effects of the above items.